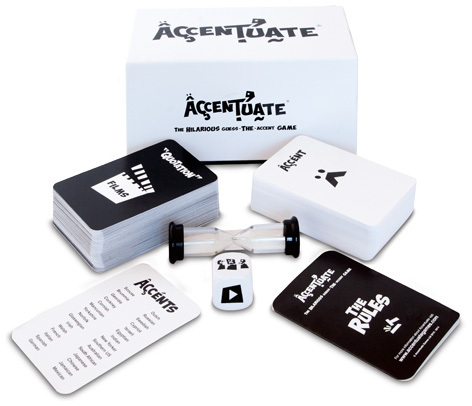 Introducing Accentuate... the hilarious ‘guess-the-accent’ party game that curls toes, twists tongues and induces blushes! Accentuate boasts a simple yet humiliating premise, repeat a given film quote aloud in a randomly selected accent whilst you copy a Cockney, mimic a Mancunian and ape an Aussie. Your team-mates must try and win points by correctly guessing the accent, with bonus points for naming the film and its year of release. The worse the accent attempts the more hilarious the game, as players struggle to separate their Geordie from their German, their Scouse from their Spanish. The game features 30 different accents, a third of which are British. Accentuate players have just 30 seconds to recite one of the 90 famous film quotes in their randomly selected accent. Please tell us what you think of Accentuate.